Since beginning the Adamsdown Song project and first hearing of the soul singer Gill ‘Tawny’ Reed, of Diamond Street, Adamsdown, I’ve done my best to find out more about this largely forgotten star, tracking down musicians who played with her, meeting members of her family, and researching her sadly short life. As a result of this I wrote an article about her, first posted on my creative writing blog, but now moved to a more appropriate home on this site. Please read it and get in touch with me if you know any more about Gill. The glorious days when Adamsdown Song topped a leading internet chart may be over, but our success is not forgotten: Soundclick, top site for people uploading their own music, records our best chart position on our page there: number one. At the end of last term, Tredegarville Primary’s Year Six performed the song live at a special school event and did a fantastic job of it. Well done. Hopefully this will not be the last time the song is performed, as all along it was planned as a Song for Adamsdown to be passed on as a celebration of the unique area in which we live. The fans of Adamsdown Song group on Facebook is still growing and there have been steady sales of the CD on Clifton St at Hungry Planet. This website has had well over 2000 hits and we have received compliments from all over the world. Once again, well done to everyone involved. However, there are still plenty of people in Adamsdown who still aren’t aware of the song, so keep spreading the word! 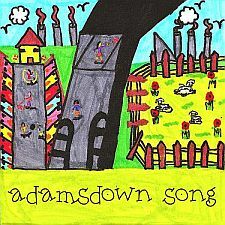 The Adamsdown Song CD is now on sale at Hungry Planet, Spar and Driscolls on Clifton Street and through the three Adamsdown primary schools. If you can’t get hold of a copy simply email us or visit the Adamsdown Community Project on Moira Terrace. Thanks to everyone who made the launch event such a great success. Adamsdown Song has now featured on BBC News online, BBC Radio Wales (Good Evening Wales and the Adam Walton Show), Radio Cardiff, the South Wales Echo and a host of websites around the world – try googling ‘Adamsdown Song’ and see what comes up! If funds are made available, we’re hoping this project will be just the beginning and there will be a chance for many more of Adamsdown’s residents to get their voices heard. The launch of Adamsdown Song finally takes place this Thursday, 11 June, 4pm, at Adamsdown Primary School. Everyone is welcome to the launch of our internet chart-topper, where we’ll hear the song, watch the video, see pupils’ artwork and poems and finally get our hands on the CDs! Pupils who took part in the project are entitled to a free CD, as are staff from the three schools involved and others who’ve helped with the project. Everybody else can buy the CD for just £1. After the launch the CD will be available at shops on Clifton Street and an exhibition of pupils’ work and the historic photos of John Briggs will be on display at Roath Library. Finally, an apology to one of our star singers, Emma Bishop, who’s name is printed wrongly on the CD sleeve. If we reprint the CD that will be put right.